"Leaving on a jet plane, not sure they'll let us back on again." Oh, wait those aren't the lyrics? Husband has taken the kids with his dad to visit his grandmother. The first time I visited Husband's family they told me we were having lunch with his grandmother - I hopped in the car and we drove and drove. A 2 hour trip each way which is more like how long it takes to get to a vacation destination in Massachusetts. Anyway, this means I can't upload any photos (he has the camera) but I can tell you how the first leg of our trip went. We fit everything in one suitcase (including our stuff), 2 diaper bags and 1 backpack (mainly for my work laptop or we could have gone without). We only took 1 baby bjorn and 1 stroller. My nanny pulled most of the kids' stuff on Friday while they napped so that made packing easier. Ned only really cried as the plane landed and Penny slept on me a little but it was a long, long day and being in a strange place resulted in fussy eater (Penny) and sleepers (both). I felt badly for the woman next to me when Penny kept trying to grab her jean jacket and turn the pages of her book. You really notice how small those airplane seats are (especially on commuter jets) when you have an infant in your lap. 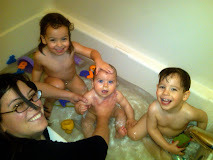 It is amazing how I just assume we'll get special attention/treatment because I have young kids with me. And we do - people were very nice. There were lots of kids on the plane and in fact another 9 month old (5 days younger than my kids) was sitting right in front of us and Penny of course flirted with him and everyone else. He was a giant baby - probably three times her size. I laughed to myself when his mom turned to her husband and said something about how much easier it is to have one baby because they could trade the kid back and forth when he was rambunctious. Yup - I could barely see Husband's head about 7 rows in front of me. My sister-in-law hosted a party for the kids on Sunday afternoon. The guests of honor did pretty well being surrounded by more people and kids than they've ever seen in their short lives. Hopefully Husband's cousin will send me some of the photos he took so I can post them. Only one more flight back home on Tuesday morning and then hopefully back to normal. I think it is going to take at least a year before I want to fly with them again. Visitors are welcome at my house any time though! That stinks that you guys couldn't sit near each other. Our next trip (in December) we are doing 4 seats instead of two. It was cramped with 5 month olds - I'm sure with 9 months olds it was even tighter - and squirmier!! I definitely think the extra seats make a big difference in getting a chance to "relax" on the plane. But I'm with you. We took a terrible (TERRIBLE) trip when the boys were 15 months old and that put us off from traveling for 9 months. It was two regional jets, flight delays, running through airports with GoGo Kidz, and two very unhappy toddlers who were on the verge of screaming every 5 minutes. And it was 100 degrees at the Fargo lakehouse with no a/c. You can imagine how well the boys slept and no one napped the entire time. Now it is so easy to travel with the boys I have to pinch myself! guess who's black, and furry, and very happy to see me today? well it was more like, "give me food, and get the heck out of here if we arent' going to watch tv"